I bought a sprouting dish at Planet Organic years ago and started using it finally last year. Again, something so easy I didn’t do it. Well, now I am addicted and we have sprouts growing at all times in our kitchen. I have experimented with a bunch of different seeds, legumes and grains. 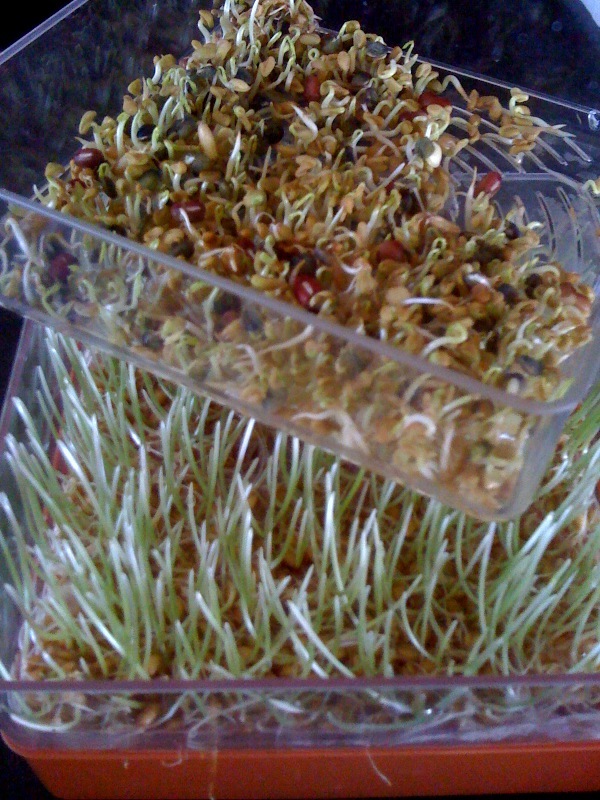 I believe that Community Health sells sprouting trays and I recommend picking one up. You can buy the seeds/grains/legumes bulk or buy packages of them. Mum’s Sprouting Seeds sells a bunch of seed options on their website and has a bunch of info to sprout on your own. You can buy the packaged ones at Planet and Community. I recommend buying their Easy Sprout, which I love for sprouting quinoa. A fellow health food junkie Trina introduced me to this fantastic little sprouting buddy. I now have quinoa ready for eating in the fridge all the time. Now, you don’t need these special tools to sprout, you can use a jar. Put cheese cloth over the opening, secure with an elastic. Add the seeds/grains/legumes to the jar, cover with filtered water, you need to soak the sprouts for 2-8 hours, depending on what they are. Just think quinoa, small, less dense 2-4 hours. You’ll see them sprout in 2 hours. Wheat berries 4-6 hours, larger and more dense. Rinse them a couple of times, draining water through cheese cloth, replace with fresh filtered water. When they are finished soaking rinse really well, leave in jar, no water, cheese cloth on top for air circulation. Leave in fridge or counter and watch them sprout, rinsing once or twice a day (not all need this though). I think they sprout faster on the counter, but then I refrigerate them. There are so many options and it is fun to experiment. 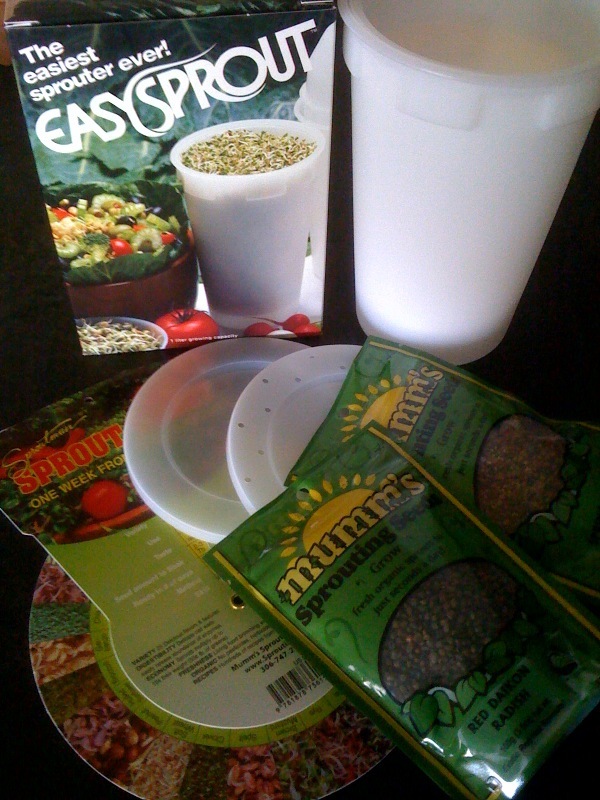 When you order an Easy Sprout you can order a sprouting chart or google sprouting charts, there are lots of references. We have tried the Mum’s Wheat Berries (long greens, sweet and crunchy, pictured in the bottom tray below), Spring Salad (small, nutty-spicy sprouts), Red Daikon Radish (bright red and spicy), Crunchy Bean Mix (packed with protein rich legumes, pictured in first picture below when first placed in tray) and my favourite at the moment, Ancient Eastern Blend (mix of fenugreek, lentils, kamut and adzuki beans, pictured on top tray below). I add them to salads, smoothies, rice, quinoa, wraps, to toast, anything really. Find ways to incorporate them. Sprouts are packed and concentrated with vitamins. Enjoy! What do you do with the sprouts my dear? Do you eat them solo? Add them to salads? I’d love a recommendation!